Heart disease is the leading cause of death for both men and women in the United States, and the older we get, the higher our risk. February is American Heart Month, a month set aside to focus on heart health awareness and how to live a heart-healthy life, no matter your age. Science also points to a strong connection between heart health and brain health. If your heart isn’t pumping well, the cells in the brain will struggle to get the food and oxygen they need, which can impact cognitive function. Taking steps to live heart-healthy can truly impact every aspect of your life. Know your risk. A number of factors may increase your risk for developing heart disease or suffering a heart attack or stroke. Age, gender and family history are a few factors we have no control over. Other risk factors, such as weight, tobacco use, physical activity and diet/nutrition are within our control. Exercise daily. Keeping your body moving is essential, but as we age, getting in regular exercise can be tricky. Talk to your doctor about the best kind of physical activity for you. Even taking short (10 minutes) throughout the day can help keep your heart in good shape. Aim for 40 minutes of exercise three to four times per week. Focus on nutrition. What you put into your body is also important and can play a significant role in your heart health. Make cooking at home a priority and eat nutrient-dense foods including colorful fruits and veggies, lean meats, fiber-rich whole grains and low-fat dairy. Again, your doctor can help make specific suggestions for heart-healthy nutrition if you have a health condition that limits your diet. Manage your health. If you have an existing health condition, such as diabetes, high blood pressure or high cholesterol, work closely with your doctor to keep your health condition in check. Minimize stress. If you experience stress or anxiety on a regular basis, it may compound existing heart disease risk factors. Make stress reduction a priority and find healthy ways to relieve your stress, such as exercising or participating in a hobby or activity you enjoy. At The Cottages Senior Living, we are committed to helping our residents live their best at this stage in their lives. We provide opportunities for group activities and exercise as well as nutritious meals to promote health. If you or someone you love has one or more risk factors for heart disease, work with your doctor to keep your health problems under control. 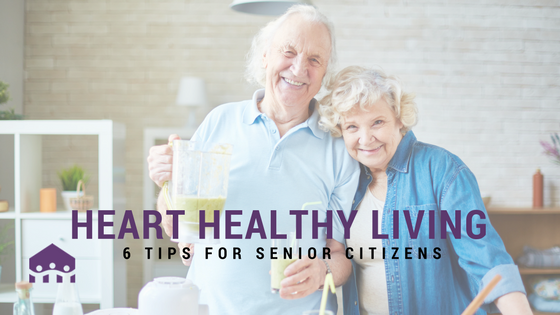 No matter your age, it’s never too late to start living heart-healthy!